Roll up for House Hoopla! As the world economy lurches from one crushing disaster to another, and house prices continue to slide, UK homeowners are resorting to unconventional selling methods. They have given up on securing their (admittedly ambitious) asking prices via the usual routes, and are raffling off their homes instead. I’ve come across three house raffles this week. The first home is rather swanky; it was featured on Channel 4’s Grand Designs, which is the Holy Grail for housebuilders. It’s a three bedroom house in Cheltenham (very la-di-da!) and is a memorable Grand Design because most of it was built underground. If I remember rightly, there were problems getting planning permission for a large structure more than two storeys high – so the couple who owned the site decided to dig down instead. It’s eco-friendly, too: exceptional cunning means that the underground part is lit by natural sunlight, and the home heating comes via a ground source heat pump (don’t ask me how it works). More here. The owners haven’t been able to find a buyer for the property, which is currently retailing at £845,000 ($1.6 million), so they have launched an online raffle, which will be drawn in the New Year. Tickets are £25 apiece To enter online, visit the official website. However lovely their home is, it’s worth bearing in mind that the average house in that area is a relatively meagre £170,000. 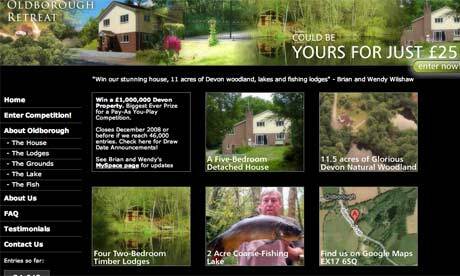 So the enterprising couple are raffling the house on the internet – again, for £25 a ticket. Of course, the question mark hanging over both raffles is this: what will happen if insufficient tickets are sold? Both couples say that if their reserve prices aren’t met, they will make the draws anyway, with the winners receiving the prize fund. I’m tempted to enter both these auctions – after all, the odds are better than the National Lottery’s. However, these raffles only work if an awful lot of tickets are sold, and both couples have a long way to go. Right now the raffle for the Cheltenham house, despite being featured in national newspapers, has dispensed just over a tenth of the 46,000 tickets that have to be sold if the draw for the house is to go ahead. Note: People who run these draws have to be careful, because under English law it’s illegal to run a lottery for personal profit. So these aren’t “raffles” in the strict sense of the word. People must successfully answer general knowledge questions, before they can enter. This home in Devon has also been in the newspapers, and is the subject of a forthcoming BBC programme. It’s a five-bedroom home with 9.5 acres of woodland, two-acre fishing lake and four holiday lodges. The retail price? £1 million ($1.8 million). 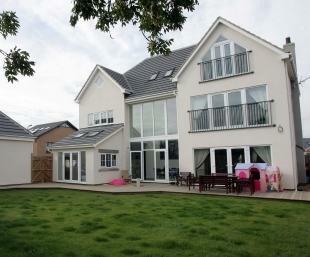 The couple who own this house have now reached their ticket sales target: 46,000. (I’m too late. Sniff.) The draw is expected imminently. So it can be done! In our current climate, do you think this method of selling homes could take off? UPDATE: This post was selected for the 144th Festival of Frugality, hosted by David at My Two Dollars. UPDATE: You can read my follow-up to this post here. You do realise that all of these raffles are potentially illegal lotteries and a little bit of surfing will uncover quite a few more. If you are thinking of using this format in the UK you will be relying on the Gambling Commission remaining apathetic. If you try it in the US you will almost certainly be risking prosecution as the US attitude to on-line gambling is far more unforgiving. Hi Sima – thanks for your comment. Yes, the organisers do seem to be aware of this potential snag. It’s a murky area of English law, but people are opting to get round this by asking entrants to answer general knowledge questions – so that their enterprises are prize competitions, rather than prize lotteries. Some experts have raised eyebrows, but it’s looking good for now. See this Guardian story for more info. If it does all go pear-shaped, I shall certainly be blogging about it! You say the third house is the subject of a forthcoming BBC programme. Do you know what programme or when? Ben Steele is producer of a BBC Money Programme report on the Wilshaws to be broadcast in October. I guess we’ll have to keep our eyes peeled. The answer to this question begins with ‘no’. As these lotteries are using a question to pass themselves off as prize competitions, it may be worth asking them if they have recently received any communication from the Gambling Commission requesting proof that they comply with Section 14(5) of the Gambling Act, 2005? Hi Sima – thanks for the update! Q. If I arrange a prize competition that eliminates entrants by way of a question then can I be sure this is not a lottery? No. The test of whether or not a competition is a legitimate prize competition depends on whether it meets the requirements of section 14 (5) of the Gambling Act 2005. That depends on the circumstances of the particular case. We would advise those considering running a scheme of this nature to consult our guidance and to take independent legal advice before proceeding. I recall from the newspaper reports that the Devon couple and the Cheltenham couple have sought independent legal guidance – I’ll have to check back re. the Teeside couple. I was watching GMTV the other day and one of their “prize competition” questions was a multiple choice on who Victoria Beckham was married to. The homeowners’ questions seem like University Challenge in comparison! The point is that their legal adviser does not appear to be an expert in gambling law. You can look him up – he works for Ralli, a Manchester law firm. You may also want to check through a series of articles from a legal expert in Gambling Law on the Out-Law website. You only need your scheme to pass one of these tests, the schemes posted here fail both because of the design of their ‘so called’ competitions. I think you have a valid point regarding the ludicrous simplicity of the GMTV quizzes, but they do not fall foul of the law by providing a free entry route. Also the media is more tightly regulated by Ofcom, so there is less risk (now more so than before) of irregularities. Hi The oldborough retreat has come to a positive conclusion and the draw is going to take place in the next week or so. I am so pleased for them. We have just launched our own competition to win not one but 2 Luxury houses in South Africa for only GBP30.00 a ticket. Our competition is a crossword and then the entrants have to complete the anagram. Please can you look at http://www.2homes2win.com.